As in other neurological disorders, a complete neurological examination is the starting point for diagnosing headache disorders. During the neurological examination, the patient may be asked to perform certain tasks that evaluate a specific part of the brain or spinal cord. Also, reflexes and strength are tested in different ways. After this initial examination, the neurologist typically has a certain diagnosis in mind and further diagnostic testing can be ordered if needed. For most patients with headaches, the diagnosis is straight forward and diagnostic testing other than the neurological examination is not required. However, if abnormalities such as tumor or stroke are suspected, an MRI may be ordered. MRI is a method of capturing high-resolution pictures of the brain. During an MRI, the patients lay in a large tube while magnetic fields are used to capture information about the brain. A powerful computer translates the information into images that are so detailed that the modern MRI has been compared to direct viewing of the brain (like that seen during autopsy). MRI can be crucial in diagnosing disorders of the brain (such as stroke) that can lead to imbalance. Like the MRI, the CT scan provides pictures of the brain. Rather than magnetic fields, X rays are used to construct the images. Although the resolution of the images is higher with MRI, CT is more sensitive for detecting bleeding. For this reason, CT imaging is the test of choice if a brain hemorrhage is expected. A lumbar puncture often referred to as a "spinal tap" is method of evaluation the spinal fluid that surrounds the brain and spinal cord. During the procedure, a needle is inserted into the lower part of the spine and fluid is removed for analysis. The spinal fluid pressure also can be measured. In the case of headache, a lumbar puncture can be helpful in ruling out bleeding (i.e., subarachnoid hemorrhage) or infections (i.e., meningitis). Also a condition called "pseudotumor cerebri" causes headaches from increased spinal fluid pressure and this condition is both diagnosed and treated with an LP. Cerebral angiography is a method for taking pictures of the blood vessels in the brain. There are two methods for brain angiography that are used most commonly: magnetic resonance angiography (MRA) and X ray (standard) angiography. MRA is performed much like MRI, except images are made of the blood vessels rather than brain tissue. During standard cerebral angiography, a tube or "catheter" is placed in an artery in the groin and then threaded through heart and into the arteries of the neck. A radio-opaque dye is then injected into the vessels and X ray images are made of the brain arteries. Standard angiography offers the highest image resolution, however, MRA is easier to perform and is noninvasive. Cerebral angiography is used most often to diagnose aneurysms. 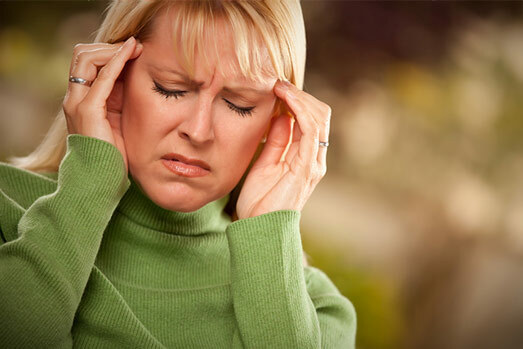 At California Headache & Balance Center, we specialize in the treatment of severe headache syndromes. This allows us to offer unprecedented services to our patients. Pain relief is only the beginning. Above all, our goal is to help headache suffers regain control of a more productive life. The occiptal nerve is located in the back of the head behind the ear and it supplies sensory innervation to this area of the head. Many migraine patients suffer from pain in the posterior head and neck region. Occipital nerve blocks can offer almost immediate relief. The procedure involves injecting an anesthetic medication under the skin which overlies the occipital nerve. The relief gained from an occipital nerve block, however, is unpredictable and may last for weeks in some patients and only hours in others. The triptans are "designer drugs" that were developed specifically for the treatment of migraine. Examples of these relatively new medications include Imitrex, Zomig, Maxalt, Axert, Amerge, Relpax, and Frova. Although the pharmacological characteristics of these medications differ, they all bind to specific serotonin receptors in the brain and on blood vessels that are responsible for the symptoms of migraine. In addition to treating the headache pain, the triptans can also help relieve other migraine-associated symptoms such as nausea and light sensitivity. Occasionally, patients may suffer from severe headaches that last for several days. These more severe headaches may not respond to medications at home. For this reason, we offer injectable medications at our clinic. Examples of these mediations include intravenous dihydroergotamine (DHE) and ketorolac. This often allows patients to avoid unpleasant and costly visits to the emergency room. Whenever possible, these treatments can be done on the same day if the patient calls our office in the morning. For many patients, the goal of headache treatment is not to stop headache pain once it occurs, but to prevent the headaches to begin with. General speaking, if patients suffer from headaches for two or more days per week, or if their headaches interfere with work or school, they are candidates for preventive medications, or "prophylaxis." The three most commonly used categories of preventive medications are certain blood pressure medications, antidepressant medications, and antiepileptic medications. There are no medications in use for headache prevention that were originally invented for this purpose. As these medications were used for other causes, however, their anti-headache properties were discovered. The choice of a specific medication is tailored to the individual patient's needs and tolerance to side effects. Botox is one of the newest treatments for headache prevention. Although Botox is the same toxin that causes botulism, the medication form of this substance is in low concentration and is safe for injection. The medication is injected diffusely into the muscles of the head and neck. Although Botox induces muscle relaxtion, it also blocks pain in ways that are not completely understood. The procedure takes about ten minutes and only minor pain typically occurs. The advantage of Botox is that it has fewer side effects compared to other medications. The disadvantage of Botox is that it is expensive and not all insurances will pay for it. In our experience, Botox is not neccesarily more effective than other medications, but it is better tolerated. Also, it is a good alternative for patients who have tried multiple preventitive medications without relief. Biofeedback is a computerized technique that assists in headache prevention. During biofeedback, the patient sits in front of a computer screen that display information about body temperature, sweat gland activity, and muscle activity. The patient learns to control these bodily functions (a reflection of stress) with his or her mind. This is possible because, as the patient learns to relax, these parameters change. Although many patients strive to use biofeedback as a way to avoid medication use, in our experience biofeedback is most effective when combined with medications.